Despicable and cowardly attacks. The Junior Varsity club according to Obama. When will the world act? Christians slaughtered around the world! Innocent people slaughtered for no reason. 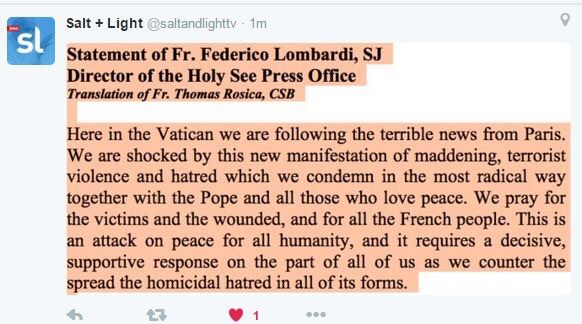 Here Is the Statement from the Vatican regarding Paris. Steve, can you comment? I think that there is a lot of common ground between Islam and the de facto atheist-humanists who run the Western countries. Think about it: Islam, in a sense, depersonalizes the Supreme Being as being totally unknowable “other” whose only utterance — the “Recitation” (Koran) — is a kind of totalitarian/ideological roadmap that radically contradicts human dignity by abjuring any of the Judeo-Christian “nonsense” about people being made in the image and likeness of God. Atheists embrace materialism, which also depersonalizes existence itself — again, the result is the radical devaluation of individual persons, resulting in all the horrors of “modern, progressive” Western (and Eastern/Communist, and, formerly, Nazi) “civilization” (sic), such as euthanasia, contraception, abortion, etc. So… the radical leftists governing the West have common cause — i.e., the destruction of Christianity, which of necessity means the Church. I have heard Jihadists proclaim that their ultimate target is, in fact, the “Crusader” headquarters — Rome, the Church. John, picking up a group here in Tel Aviv but just read your comment. It seems like you’ve made a rational connection to me and I think it’s worthy of exploring. I forgot to make it clear, above: Christianity, uniquely, claims for itself, in the person of Our Lord Jesus, the revelation of God as Person (three persons in one). Jesus says that to see Him is to see the Father, because the Father and He are One. This claim — a joyous revelation; literally, “good news” — of a personal, loving God who knows each of us by name — touches upon what Joseph Ratzinger would have called the theology of the “face”; and upon what the Church herself teaches, that we are destined for the “Beatific Vision,” in which heaven is the eternal beholding of the “face” of God; in which, St. Peter says, in 2 Peter 1:4, we can become “partakers in the divine nature” if only we choose to follow Jesus to Calvary. WE, the United States, should take the lead. Unfortunately Obama ran on an anti “troops on the ground” platform and Islamic terrorists know that. We are so obsessed with riding another country (Syria) of a tyrant that they, like Iraq are in chaos. Unfortunately, sometimes, the lesser of evils need to be supported until more opportunities come along. 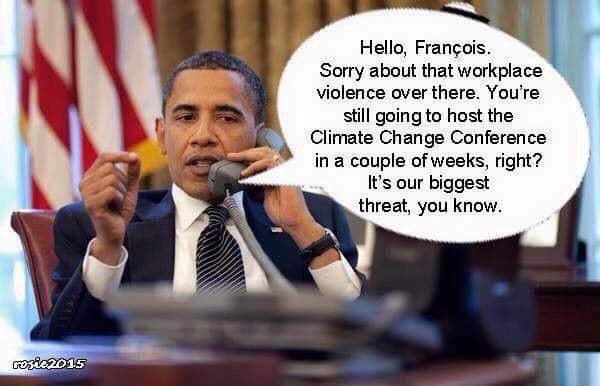 Maybe Putin will be the point man, Obama certainly is not willing to be. Previous post: Are Mormons Right on Total Apostasy of the Church? Next post: Pope says, Turn off TV, put down smart phones, turn off computers and eat meals intimately together.